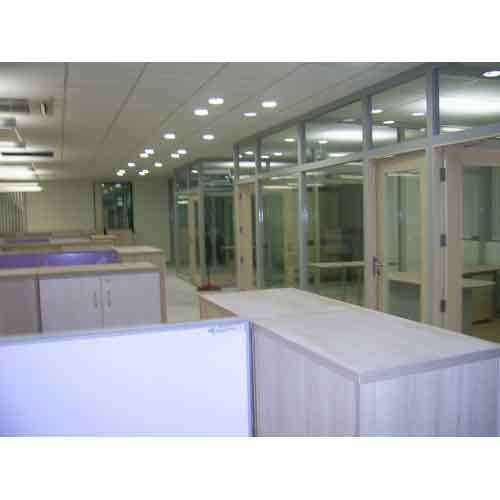 Our organization has achieved appreciation for offering a quality range of Glass Glazed Partition. These partitions are made using high quality glass which is glazed from both the sides. We execute the installation of these partitions with utmost care to avoid any damage to the glass. Saanvi Interiors India Pvt Ltd was established in Aug 2012. We have emerged as one of the leading and reliable Service Provider in the field of Turnkey Projects for Interior Designing Services and also for Commercial & official & Residential Units on Pan India Basis. We also value EHS and its effectiveness implementation throughout all stages of a project. Saanvi Interiors India Pvt Ltd is having the quality management system ISO certified 9001:2015 and EHS System OHSAS Certified 18001:2007. We create unique & out of space ideas and execute the All types of Turnkey Projects with complete package of Interior & Exterior Services Like as Civil , Interior, Furnishing & finishing, Electrical, Plumbing , Networking & HVAC Works for Corporate, Commercial, Official, Residential Units. Our complete package includes services like Ceiling Decor Services, Flooring Services, Partitions & Panelling, Exterior Decor Services, Furniture Services, Wooden Work, Interior Decor Services and Corporate & Commercial & Office & Home Interior Decor Services. Our services create a sense of place and identity suitable to the needs of clients. Our professional approach has helped us in maintaining the international quality standards. We are growing as experienced contractors who understand the client's requirements and thus undertake designing, construction and finishing of different buildings & corporate, commercial, official and residential units. Depending upon their needs, we concentrate on the area of the space, quality construction material and the budget specified by our clients. We combine elements like shifts in scale of space and elevation in ways, which reinforce the overall design theme. The final amalgamation produces a very strong statement with the realization of a place with power. We are looking corporate and individual inquiries from Delhi NCR, Haryana ,UP, Maharashtra, Goa, West Bengal, Rajasthan, Punjab and all over India.